According to a report by Colliers International, Singapore comes in the second place among the top locations in Asia for the technology sector --just after Bengaluru, in first place, and Shenzhen, following Singapore in the 3rd place. Colliers’ “Top Locations in Asia” --that aims to identify and recommend the best urban locations in Asia for three major occupier segments including technology, examined 16 large Asian cities in both developed and emerging countries to conclude that that the three top location choices in Asia for technology occupiers are Bangalore, Singapore, and Shenzhen. The research examined nearly 50 criteria relevant to the choice of location under three headings, socio-economic factors, property factors, and human factors, and assigns a score on each metric. 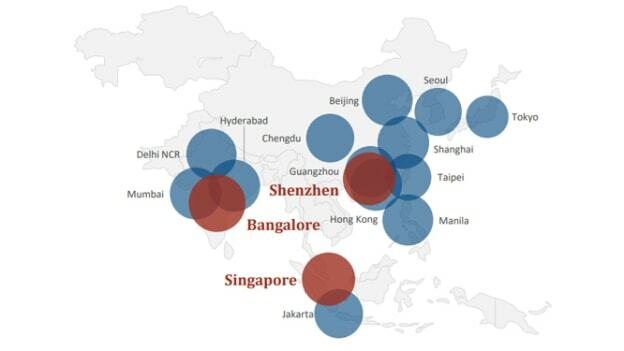 Three cities scored 61 percent or above are Bangalore, Singapore, Shenzhen. These are the top choices for starting or expanding technology operations in Asia. 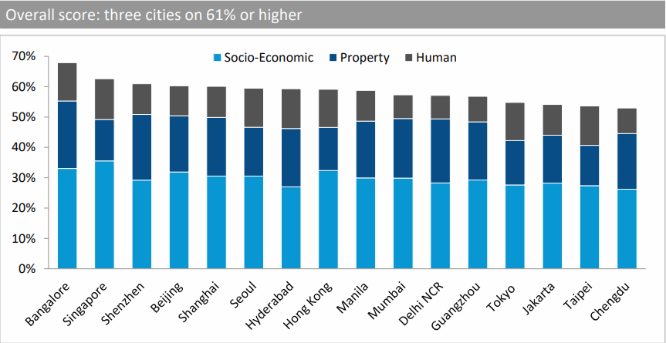 Bangalore scores highly on long-run growth and low costs; Singapore scores highly as a talent source and on aspirational metrics; Shenzhen ranks well on property measures, according to the study. Beijing and Hyderabad are attractive alternatives, and Hong Kong is starting to be exciting. The scores for the other cities lie between 60 percent and 50 percent. Dull long-run growth prospects hold down developed cities like Tokyo and Taipei, despite good scores on human factors. Emerging cities mostly have high growth and low costs, but suffer on employment criteria and human aspirational metrics. Singapore scores 63 percent in the ranking and comes second overall. Moreover, Singapore tops the chart for talent and employment criteria, and human aspirational measures. “Singapore’s second place reflects the city’s high score on socio-economic factors, due largely to its strong reputation as a source of talent, as well as a high position on aspirational measures such as personal tax rate, safety, and lining quality. Looking ahead, Singapore should continue to benefit from its position as the natural financial and communications hub of South East Asia, and from the government-supported transition to the so-called Fourth Industrial Revolution,” says the study. As an example of Singapore’s attraction to major technology enterprises, Facebook, the huge social media group, recently announced a plans to build an SGD1.4 billion (USD1.0 billion) data center in Singapore, its first such in Asia, The data centre will be located in Tanjong Kling which was formerly known as Data Centre Park, and is due to start operations in 2022. Colliers’ “Top Locations in Asia (Technology)” report builds on its earlier “Tech Trends in Asia” research by recommending the best urban locations for technology occupiers. Tech Trends in Asia had four conclusions. Acquiring Talent is the key challenge for technology groups in Asia. Talent is concentrated in specific cities in key markets, notably Chindia (China and India), which also offer high growth. To retain talent, technology groups need to move toward the CBD or CBD fringe. Finally, artificial intelligence (AI) threatens demand for space but will drive growth and returns. These conclusions lead us to weight growth and availability of talent highly in our “Top Locations” scoring. Image Source: Colliers International Group Inc.